Not my point at all. I understand. I'm just saying in this context, it takes an even higher level of bitachon, though I'll concede that the two opponents were about equally formidable. Give me a break. Warriors were up 3-1 in the finals and likely would have won in 5 if green isn't an idiot. Eh. Then why didn't they win 6 or 7? I agree with Dan, Green was there for 6 & 7. If Irving was health in 15 or if Lebron never smashed into the cameraman the Warriors would have never won one championship. Arrieta, Hendricks and Lackey all could be dominant on any given night, which is as good as anyone can ask for historically except for Schilling and Bumgarner who are consistently dominant. Their hitting is somewhat controllable with great pitching, but whose isn't? 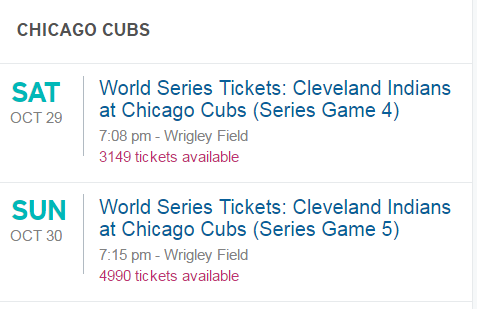 Whoa, when is Stubhub's cutoff for Cubs tickets? Went to check and it's already closed! They were selling Indians tickets up until the first pitch. 6 hrs, I thought it was weird too. That kills the market crash idea. I couldn't have predicted that. Where did all those tickets go after the close? Still lots of tickets for the next 2 games, but with the market closing 6 hours early it takes away the ability to grab a last minute bargain like you could in CLE. You can still get them from brokers. Many will put tickets up figuring if someone is going to pay that price they will sell them, if not they will be going to the game.